We are located a short 5 minute drive from the small town that is Sen Monorom. The cabins are spaced out nicely in the valley surrounded by nature. There are also free roaming horses and cows we look after in the valley. Nature Lodge offers an original accommodation experience with plenty of private space and comfort in rustic natural setting. We have rooms to suite any type of traveler. 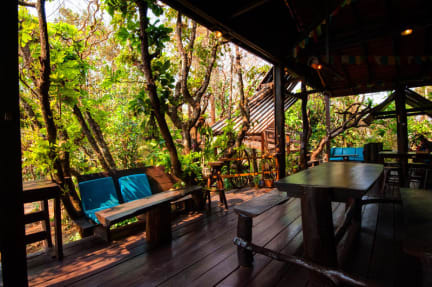 These range from private single bed cabins, double bed cabins and 3 bed and 4 bed family houses.We have a lovely and relaxing bar and restaurant area selling a range of drinks and both Western and Asian food. Free Wi-Fi is available around the bar and restaurant area. The Nature Lodge is truly a relaxing getaway for any nature lover or for someone who just needs a relaxing holiday or break. We also work closely with the local NGO's and can help assist you in planning any trekking or elephant tours. Bar and restaurant open 7am-10pm. Please contact us prior to arrival if you will arrive out of these hours. 4. Our cabins are located on large valley and wheelchair access is not possible. I really loved this experience! 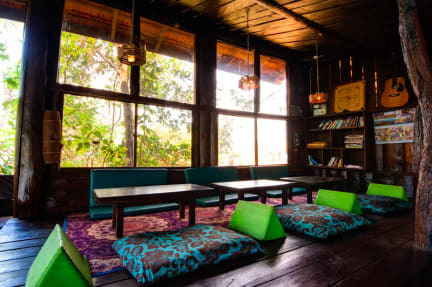 The huts are sweet, and the loungey area to hang is totally cool. i did the elephant swim day hike, def a go for sure!!! Loved our stay here. They also run an awesome trekking and elephant tour in partnership with Mondulkiri Wildlife and Elephant Sanctuary with Mot as the guide. Absolutely amazing experience. Amazing place all around, just a bit far away from town and the food in the restaurant is a little overpriced. Calm, beautiful and both the restaurant and room was great!! The Nature Lodge was the perfect place to relax and be one with nature. Stayed here for 2 nights, explored waterfalls, and went on scenic drives. Didn’t get a chance to see elephants but that seemed like a big attraction. The food was good and the people were nice. The bathroom in the lodge was very unique with a rocky floor I loved it! Beautiful sunsets at this location. Every bungalow has it's own hammock on the porch. I did not receive a friendly welcome which I always appreciate when I'm far from home. The Nature Lodge is committed to educating local students on the hospitality and tourism industry, which I loved! As a result, many are still learning English and it's challenging to communicate. I tried to arrange a bus to PNH airport at reception, but was dropped at the wrong location because of the language barrier. Staff is sweet and welcoming. The location is a bit out of the way, but it is kind of nice to be in the country side. When that is said, don’t let Lonely Planet fool you. The WiFi in my cabin was nonexistent. The WiFi at the lobby/bar area didn’t work either. The boiler for the shower in my cabin was broken so I couldn’t regulate the temperature: almost boiled myself alive... The mosquito net had large holes in it. Bad and expensive food in the restaurant. I really can’t recommend the place. Although the staff was very nice, including fake smiling etc, I was really shocked by the lack of cleanliness at this place. There were rat feces on the bed and an ant problem in the bathroom. I asked to change rooms, which was then granted. They then put me in an more expensive room, but the bed was not made and also here, lots of rat feces on the bed. I decided to sleep on a side table (cleaner than the bed) and in the morning found rat feces and a tiny pool of pee next to my table! -They changed my room without telling me. They should inform clients in advance, not on arrival. -In the bungalow there was a smell of feces (and they were visible, in fact), possibly made by rodents. I know that it is a place in the middle of the countryside with animals, but bungalows are not well sealed and many insects and small animals enter the bungalows. -The worst sandwhich with the worst bread I never ate. -Almost nobody speaks English. One food order was wrong, and I almost miss a bus.